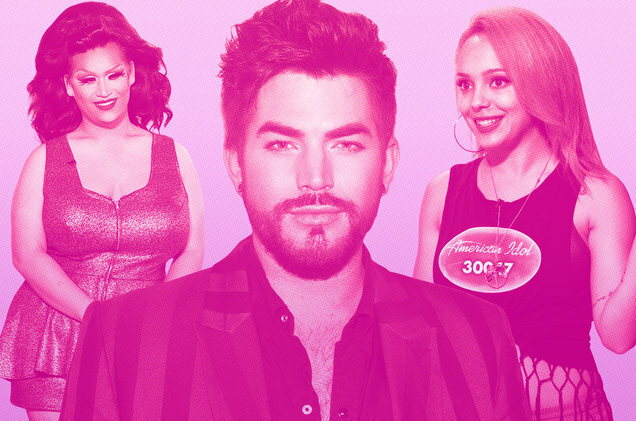 Out Idol contenders have found chart success over the years. Both Lambert and Aiken achieved commercial triumphs with their debut albums, and Lambert’s 2012 sophomore album, Trespassing, even topped the Billboard 200, making him the first openly gay artist to reach No. 1. Previously, Aiken’s debut album, Measure of a Man, peaked at No. 1 in 2003, but he wasn’t openly gay until a half decade later. Yes, I recall Adam saying on a talk-show that he would tell everything after the completion of S8/AI. I wasn't quite sure by what 'everything' was. Now in retrospect...he wasn't able to say openly he is a gay man on AI. Photos soon surfaced and everyone was sort of ooooh ahhhh about it. I too, to be honest thought maybe I'd not watch AI anymore because Adam was the sole singer I was watching. It was around the time he sang Feeling Good walking down the flight of steps wearing a white suit...and lo and behold, he held the last ooooo note so long, it swept me back to reality lol! I think Adam did quite a lot worldwide to present gay people as people like you and me, no different in terms of needs, love, acceptance. I usually use the acronym LGBT without the Q because if you are questioning or feeling queer (Q)...you will most likely fall into one of the 4 stated catogories, lesbian, gay, bisexual, transgender...rendering the Q somewhat redundant. Straight people, so termed, do not question or feel queer at all with regard their gender identity, it doesn't occur in their minds. Only my angle, from so-called straight mind. lwl! Mirela, thanks for those links. I voted on a few of them. Mirela...thanks... I voted for all categories. The difference in where Adam is located in each poll is amazing... from 1st to 218th! He should be first in ALL those polls, IMO. BTW ....LBGTQ is THEIR designation, not ours. It's not our choice to drop the Q. 1) lesbian, gay, bisexual, transgender, queer/questioning, intersex, and allies. 2) lesbian, gay, bisexual, transgender, queer/questioning, intersex, and asexual." I think the Q can be dropped, but if the LGBT community thinks Q is necessary, I have no qualms with that. I usually state LGBT which is a defining acronym for a community/group. On the other hand, Q does not suffice as a category...what if those questioning turn out to be straight / heterosexual. Also, I am not in agreement with putting labels on people; I'd rather we accept everybody as one of us, who and what they are, rather than box them into a separate group of people. Singapore's Prime Minister also used the term LGBT during his National Day rally speech 2017. "Q" is a rather more recent addition to the standard initialism LBGTQ.... Straight people who don't use it now are either... 1. Uninformed, 2. Behind the times, 3. Disinterested, or 4. Prefer their own interpretation. Reference: NBC news - by Noel Gutierrez-Morfin - Oct. 26, 2016 ....GLAAD officially Adds the "Q" to "LGBTQ" into the latest edition of its "GLAAD Media Resource Guide"...which is the industry standard for fair and accurate reporting on the LBGTQ community. LGBTQ has been recorded since 1996. Not a "recent addition"! By your sweeping conclusion, it would mean Hillary Clinton, Lee Hsien Loong and CNN are all "uninformed, behind the times, disinterested". Come on! Wake up! These people have meticulous brains! Like I said LGBT encompasses: lesbians gays bisexuals transgenders; so it's absolutely sufficient to use LGBT. But like I stated above, if the LGBT community wants to include Q...they must have a very good reason to do that and I'm not questioning the inclusion! Note.....the quoted article states the...."Glaad OFFICIALLY adds the "Q" to LGBTQ into its LATEST edition"....the implication is that it had already been in use previously... which it had been...just not yet "officially" recorded as such by the community. The article did not state how long, or commonly, the "Q" had been incorporated....Just when it became "official". Why comment on who said what?.when?. Whether they were right or wrong is not my concern. However, if the LGBTQ has been in use since 1996, as you insist, Clinton, Loong and CNN certainly WERE incorrect, weren't they? You "wake up"! The LGBTQ community can call itself whatever it decides, and we should honor that, instead of determining that WE know better......Just like we call ourselves Glamberts...our perogative. And when Adam says LBGTQ, we should accept that as correct. It's NOT Rocket Science, after all. Certainly not worth any further discussion. If you are determined to omit the "Q", have at it! My point is LGBT is adequate and correct usage; that's all, until such time Q is officially implemented. Right now LGBTQ is used and they must have a very good reason to include Q. Many distinctive sources, that I stated above use LGBT instead of LGBTQ, perhaps the Q is not official in the courts/law but widely used by the LGBT community and I honour that; nothing against their inclusion. Still think LGBT is official and adequate. Read again..and comprehend...my entry at 1:20. LBGTQ IS Glaad's current official designation ....They consider LBGT inadequate and inaccurate. "Granted, some LGBT people still consider queer a slur, and many of us have experienced it as one. The GLAAD guide does note that not everyone has embraced it, but it advises the media that LGBTQ is a more accurate and inclusive description of our population. It notes that Q can also stand for questioning, but it more often means queer." "Here at The Advocate, we haven’t made a decision on switching from LGBT to LGBTQ. We have our own style guide, which draws on a variety of sources along with our own judgment. NLGJA, the Association of LGBT Journalists, still recommends LGBT, by the way, saying, “LGBTQ is best used only in quotations or for formal names of organizations or events.” The Advocate would like to hear what our readers think about adding the Q to the acronym. You can vote in the Twitter poll below." Help us decide! Should The Advocate use "LGBT" or "LGBTQ" in our reporting? 1,633 votes • Final results"
As you can deduce, it's still an ongoing process and different organisations use it with or without the Q. I honour their decision/outcome. The whole argument started because you insist I can't drop the Q; I have nothing against LGBTQ but will continue using LGBT. I just heard you use the word *sweeping, emphatically read by Natalie Allen who swished her head as she read the word lol!...reporting on Comey's *sweeping book on Donald Trump. Actually, US is a writer's paradise, my cup of tea unsuspectedly; my poems and stories dug out by Adam Lambert. I started with 3-line haiku which couldn't contain him. lol! Or perhaps you like my description of meticulous brains, you included. lwl! I got the message....you have decided to omit the currently accepted "Q"....because YOU find LGBT "adequate"... by YOUR definition above. I'll follow Adam's and his friends' lead ...and the "GLAAD Media Resource Guide"...and use LGBTQ. After all, Adam is the reason we are here discussing this in the first place. If anyone knows what's most accurate, Adam certainly does. Notice that even the title of the article in this thread uses LGBTQ. I will use LGBTQ when it's formalised, for now LGBT is more the norm as I pointed out with so many examples given above. Different organisations use the acronym with or without the Q; so why your insistence that I have to use LGBTQ ? Why don't you call up all those organisations who use only LGBT and insist they need to include Q ? Why only me? Even some LGBT people themselves think Q / queer is a slur on their community. It's okay for the title of the thread to be LGBTQ but that doesn't mean I can't use LGBT! No correlation there. Wake up! Tell that to Adam, his friends....and Glaad. Using the "Q" is a COURTESY to them...not me. What if you/anyone arbitrarily chose to omit the "L", "G", "B" or "T" instead? Each letter has a unique meaning to the LGBTQ community. We have no right to "pick and choose". As Adam fans, we owe him and his community sensitivity, acceptance and inclusion....with THEIR definitions and criteria....not ours...or yours. LGBT is a legitimate representation/acronym and I state again I have no qualms at all using LGBTQ...got it? If you had been more alert on this site rather than burying your head in the sand half the time, you would have noticed I always fought for them. Even in my above comment, I said we should include them as one of us rather than box them into a separate group of people. I'm not saying this to bolster my argument, I practise this in my everyday life...it's our Singapore culture, we do not ostracise any group of people...LGBT or LGBTQ. Really? Then why did over 20,000 Singaporeans sign a "Petition against Adam Lambert performing in (New Year's) Countdown 2016" in Singapore? Doesn't sound much like the open minded and "inclusive" culture you just described. Whatever... I've said all I intend to say on this subject. I've wasted too much time on it already. Finis. Well, well...I knew you would bring this up, frog in the well, with head buried in the sand most of the time, 3 steps behind. How come you didn't state the subsequent response of 24,000 petitions to slam down the 20,000...and they sure beat them to a pulp. Final decision...Adam was invited cordially to sing for about an hour on our 2015-16 New Year's Eve on The Float at Marina Bay; alongside other artists/singers. The 20,000 had an axe to grind; it was later reported outsiders were also involved including Americans in league with their Singaporean Church counterparts. This proves my point, we do not ostracise any groups of people, all treated equally, painstakingly emblazoned into our minds by none other than beloved Lee Kuan Yew and enforced till present day. And lo and behold, Adam returned the same year 17 Sept 2016 with Queen to a roaring 80,000 crowd at The Padang/Field in front of City Hall Dome. This really took me by surprise after all that hoo-ha-baloola! It's the action that counts...got it? My CNN Writer fan!...You are still here? Well, you used the word *counterparts in your CNN Newsroom report on American, British, French coalition, sending missiles streaking through the dark sky over Syria. It's war. In my context, *counterpart is sufficient. Lam-My...You are quite capable of pursuing a discussion in an intelligent, civil and adult manner. We can agree to disagree, but that shouldn't deter us from exchanging our different points of view for better understanding in a coherent and polite manner. This wasn't a life or death contest, after all....just a discussion, for goodness sake! I assume you are not familiar with more formal debating, because if you were, one of the first things you would have learned is NOT to resort to "ad hominem attacks" ...or "Argumentum Ad Hominem"... to carry your point......i.e. using PERSONAL ATTACKS...such as personally undercutting, demeaning, insulting, name-calling, labeling, etc. Your addressing me (above) as "frog in the well", "head buried in the sand", "three steps behind" are perfect examples of "ad hominem attacks". I could name dozens of others you have heaped on me on previous occasions. "Ad Hominem Attacks" are thought to be mainly used by someone who feels they are losing the debate. But whatever the reason....they WILL lose you points...possibly even a debate! I had already determined (above) to close the discussion, but your latest comments/insults here (at 7:13 PM) prompt me to return once more to tell you that....."I CLAIM THE HIGH GROUND...AND THE WIN!!!! !....because you insist on making this a PERSONAL BATTLE, using "ad hominem attacks"...instead of a civilized discussion of different viewpoints between adults. Socrates wisely said..."When the debate is lost, slander becomes the tool of the loser". I suspect an apology is out of the question.....but if you decide to make one....I am quite willing to let bygones be bygones....and to engage in interesting, adult, and civil discussions in the future. But with a NEW rule......NO MORE "AD HOMINEM ATTACKS"! O.K.? Attack is never my modus operandi; I don't need that! You started it and you are not even aware...that's why I said frog in the well, head buried in the sand, 3 steps behind and this one suits you best, moong cha cha / blur king. 1) Like above, straight away, you jump to the conclusion, I've not participated in debates! Well, I started debating since 12 years old both in school and at home; I grew up in a family of fierce debaters. 2) You also say using attack words will lose points in a debate...again you assume I don't know that! Your problem is you always think you know better than the other person when in reality you are frog in the well, head buried in the sand, 3 steps behind! 3) You said: "We have no right to pick and choose" regarding LGBT/Q. This is a flawed statement and you claim you know how to debate? "You make things up as you go along...Sorry I ask...Not Fair!" You asked for an explanation! And I tried as far as possible to clarify what you said you didn't understand regarding numerology/astrology. I was quite taken aback you could be so rude! Another one: "You can play in all the other sandboxes except the one on Trump." Sandboxes? You're talking down to me as if I were a child! So, I'm harsh with words on you because I hope you do not come back again to try to debate or talk to me just like you already bade me goodbye but you never kept that promise! "Lam-My.....I go where I wish...this is a website for Glamberts, not for Lam-My. Go wherever you wish, you have that right as much as I do. Just LEAVE ME ALONE! "Nanbert asks me to leave her alone yet she stalks me. Can't be trusted to mean what she says. Perhaps the best solution for further brickbats is your wonderful solution! which you can't keep." "Goodbye, Lammy... I'm sorry I "bothered" you. Let there be peace and QUIET between us now. I have nothing more to say to you or about you. I shall try my utmost not to respond to your fishing statements/demands like what started this long drawn-out rigmarole, terrible waste of my brain energy. Now I need to see what Pharaoh Boy is up to...lwl! Try some kite flying.....it's better for the heart than vindictiveness and spitefulness. You have obviously confused "discussing/debating" with "brawling"! I'm not going to bother responding further to your diatribe above... drastically edited and out-of-context as much of it is.............except to say that you've validated and amply displayed EVERYTHING I just explained about your "Ad Hominem Attacks" in my previous remarks. Absolutely hilarious! Textbook examples! PERFECT Argumentum Ad Hominem! Thanks SO much, Lam-MY! Good so it's settled ! It's perched ! by the way, like a bird or cicada on a tree, with a helicopter view...better than kite-flying which you seem to have embraced, my advice to you earlier on. Reminder, make sure you face away from the wind and hold up your kite, letting it catch the wind. Take 3 steps back and see your kite soar...hopefully lwl! A-ha! No, I meant purged, as in "you got rid of a lot of s--t" in your remarks. Glad to see you're feeling better, now. As for kit-flying....yeah, I remember your "advice"...... I prefer giving it a head start by running into the wind to give it a little more speed for "lofting" purposes......or at least I used to about 60+ years ago! The best place is at the beach. I miss kite-flying! But most of all, I miss galloping along that beach...and plowing through the surf... on a really rambunctious horse! It's perched with a helicopter view...my remarks/comments are always pure so no need for any purging; most likely it's yours because you are not even aware of what you are spilling and trying to slime your way through on top of it. Total : 27 2s haw haw haw! No....I WROTE it... PURGED...MY word choice...defined above. For a brief moment above, I thought we had entered a new, more civil, maybe even humorous, era.......unfortunately the leopard's spots are still there! But you immediately launched a new "Ad Hominem attack" when you accused me of "trying to slime your way through".... quickly putting things back into their proper perspective! Since your claws don't seem to be retractable, you should consider clipping them. BTW...since a PERFECT example exists above..... On our first contact... I complimented you on a limerick, and then I asked you "what is so special about 2's? "...after you posted a very similar "Timeslot" comment like the one immediately above. You answered... "because 2's look like swans"!.. THAT was your technical "numerology/astrology" answer to me (as you describe it above) that I "didn't understand". I thought you were pulling my leg, and jokingly responded "You just made that up. Sorry I asked. No Fair". You grew angry, and no explanation would convince you that it had seemed all in fun and banter to me. That is still why you describe me as "rude" in your tirade above...carefully altered to cast the best light on you. The whole situation was absolutely ridiculous and nonsensical........."because 2's look like swans"!!!!! Wow! At the time, I had no idea that you had no sense of humor! Well, to make a long story short....after being roundly "sliced and diced" by your acid tongue, I DID say...as you recorded above.. "Goodbye Lammy. Sorry I "bothered" you. let there be peace and quiet between us.... etc". The really sad part of the whole shebang was that I was quite new on 24/7, and was just trying to strike up a friendship and (I had hoped) an interesting conversation with you, Lam-My....! But I quickly got my head handed to me on a platter, didn't I? You must be very proud of the damage you caused....you had WON the battle BEFORE I even knew there was a war! It was a lengthy explanation because you said you had no idea what I was referencing regarding the numerology and not just the 2 / like a swan. That's why I got taken aback after giving you a detailed explanation and you turned round to say I made things up. I'll look up the actual conversation, quite some time ago. But that's not the crux of the problem. There have been many many other clashes between us and so just leave each alone. I've never got in your way, most of the squabbles were initiated by you. Like in this case, I gave you so many examples of high authority people, Wikipedia, using LGBT which in itself is a formal worldwide usage, but you still carry on and on and insist it has to be LGBTQ. I already stated I have no qualms about the inclusion of Q. I always fight for this group of people on this site whenever Adam brings up the topic for discussion but you don't take that into consideration, and simply bulldoze. Finally, I find it a terrible waste of my time and energy arguing with you because you drag the topic on and on when the facts are already laid out. Oh Timeslot you gave me two master numbers 22 and 33 (above time) - that is a very good prize lol! Aha above, 36 ... I see it as 369 (3+6) ... number that unlocks the universe, if you can get to the bottom of it; you might need to crawl through fire as Adam sings, and get sucked into a black hole.